The group is currently composed of Frank Reith (Group Leader), Jeremiah Shuster (Postdoctoral Researcher), Harpreet Bhatia (Postdoctoral Researcher) and PhD students Angelica Rea, Santonu Sanyal, Jared Castle (Flinders University with Prof. P Kirkbride) and Sahar Shar (RMIT, with Prof. A Ball), Honors’ student Jennie Bartle (with Prof. C. Lenehan, Flinders University). We are planning to extend the group, if you are interested in the research we do and want to know more about postdoctoral, PhD and Honors’ projects currently available and in planning, please contact Frank Reith. Jeremiah Shuster (2016 – present). Project: Gold mobility and gold biomineralisation – From experiments to models and applications. Harpreet Bhatia (2015 – present) Project: Understanding gold toxicity – from organisms to their proteins. Dr. Christine Ta (2013-14); now at National Standards Authority of Ireland; Project: Mobilisation and transport of gold complexes and nano-particles. Dr. Carla M. Zammit (2011 – 13); now at the University of Queensland. Project: Development and testing of whole-cell biosensor for gold and assessment of microbial communities associated with auriferous environments. Santonu Sanyal (August 2016 – present) Project: Bacteria from gold grains – diversity, functions and applications. Jared Castle (2015 – present, Flinders): Project: The stability of selected psychoactive substances in simulated post-mortem blood. Angelica Rea (November 2014 – present). Project: Biologically mediated transformations of gold in temperate and tropical environments. Sahar S. Shar (current, August 2012 – present, RMIT). Thesis: Mobility and biomineralisation of platinum. Christine Ta (completed, 2009 – 13). Thesis: The speciation of gold in mine wastes and natural waters. Jenni Bartle: (2016, Flinders). Project: Manganese oxide induced by gold mobility. Andrew Hennessy (competed 2015). Thesis: 3D printing stone: The application of additive manufacturing techniques to microbially induced calcium carbonate precipitation. Sahar S. Shar (completed MSc., 2010 – 12, ). Thesis: Microbial mechanisms of gold and platinum solubilisation and precipitation. Paige Sawley (completed 2014). Thesis: Supergene gold transformation: Secondary and nano-particulate gold from Northern Finland. Lachlan Stewart (completed 2011). 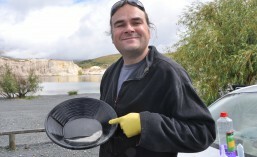 Thesis: Mobilisation Features and Environmental Mobility of Gold across New Zealand. Rebecca Pohrib (completed 2011). Thesis: Exploration Geomicrobiology – Developing bio-indicator technology for mineral exploration. Lintern Fairbrother (completed 2008). Thesis: Solubilization of gold by bacterial metabolites.